Credit card rates held essentially steady across all categories in the first half of June, despite a financial environment in which interest rates generally were falling. For example, across the U.S. Treasury bond yield curve, rates on securities from 2 years to 30 years fell sharply in early June, as concerns about the economy deepened. Interest rates on freely-traded securities like Treasury bonds can react to changing conditions on a daily basis, while credit card rates are subject to decisions by financial executives that may take a few weeks to reflect changes in the interest rate environment. Allowing for this kind of delay, do falling interest rates in the bond market mean that credit card rates will eventually follow? 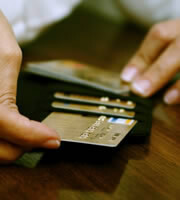 Not necessarily, because there is another area of concern which could affect credit card offers. In general, a slowing economy is associated with lower interest rates. However, when it comes to credit card offers, credit concerns are also a factor in determining rates. A slowing economy would bring more concerns about the ability of borrowers to pay off their credit card balances, and thus credit card companies might seek to protect themselves by keeping credit card rates high - or at even raising them from their current levels. So, the general drop in interest rates has not yet had an effect on the credit card offers included in this survey, and it remains to be seen whether credit card rates will join the broader decline in rates. There was no change in any of the consumer credit card offers surveyed. As a result, the average for the overall consumer credit card market held steady at 16.76 percent, with non-reward cards at 15.09 percent, and reward cards at 17.48 percent. To some extent, this stability benefits consumers. When credit card offers remain consistent, consumers can shop for rates with more confidence, knowing that the rates they are looking at are not constantly changing. In short, this would be a good time to shop and compare to find the most competitive credit card rates. Business credit card rates were generally unchanged, though an addition to the business non-reward category bumped this average up from 14.72 percent to 15.07 percent. The average rate for rewards business credit cards remained at 16.21 percent. Note that the difference between reward and non-reward rates is smaller among business credit card offers than among their consumer card counterparts. This implies that consumers are willing to pay a higher price for rewards - perhaps because individual consumers can benefit directly from those rewards, while it can be more complicated for an organization to benefit. Still, the lower premium for business rewards cards implies a pricing opportunity for organizations that can use rewards productively. The average student credit card rate held steady at 16.67 percent, which hasn't changed since late April. Year-to-date, no category has changed more than this one, but these credit card offers seem to have stabilized recently. Virtually all the consumer credit card offers in this survey advertise a range of credit card rates, with the actual rate depending on the customer's credit standing. The difference between the low end of the range and average credit card rates represents the reward credit card companies are willing to give customers with excellent credit. This differential remained unchanged in early June at an average of 4.11 percent, which is a pretty healthy reward for maintaining excellent credit. 0 Responses to "Credit card rates hold steady despite lower mortgage rates"